Big, plump Raspberries, glistening with sweet flavour will truly set the Raspberry-Lover’s pulse a-racing! A wall of red, at their peak, deliriously exciting! 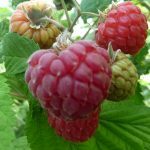 Most under cover, so you can pick during wet periods and your fruit (and you) will not spoil… Raspberries freeze very well, so you can always pick extra to tide you over the Winter. Spread out singly onto a tray, freeze overnight and place into an airtight polythene bag. Use as required. Will last beautifully until the next season; great for jam, smoothies, coulis, cheesecakes, with your breakfast cereal etc. Smoothies: Blend frozen Raspberries, fresh Bananas and Apple Juice for a quick, no-nonsense and delicious smoothie. Adjust quantities of each to personal taste. (Even a stick blender works well if you don’t have the pukka job). Jam: Weigh and defrost desired amount of frozen Raspberries. Add same weight of granulated sugar. Stir until sugar is properly dissolved (very important if you don’t want grainy jam). Bring up to a fast boil and boil for approximately 12-15 minutes until setting point is reached. Voila-you have your own homemade jam to display on the breakfast table in that bowl you have always wanted to show off! Easy-peasy! OOPS! 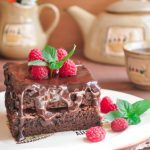 Just remembered if you like something naughty, here’s a nice, easy recipe for Chocolate Orange Brownies to indulge with your Wash Farm Raspberries. Pre-heat oven to 180C / 350F / Gas 4. Line a 20cm (8 in) square cake tin with baking parchment, making sure the parchment comes up the sides of the tin. Set a large heatproof bowl over a saucepan of hot water. Add butter, dark chocolate and sugar. Melt butter and chocolate, stirring occasionally. Remove from saucepan and leave to cool. Prepare orange zest and juice. Whisk these together with the eggs, vanilla and salt until combined. Whisk egg mixture into the cooled melted chocolate. Sift the flour, cocoa and baking powder onto the chocolate mixture and fold it in. Add the white chocolate chips and fold these in. Pour into the cake tin and bake for 30 mins (fudgy) or 35 mins (cakey). When completely cool, tip out of tin and cut into squares. Arrange in the middle of a plate, pour a good amount of Raspberries around and top off with a dollop of cream/ice cream or both! !